Having a very functional website with great content that’s optimised for mobile devices has become more important than ever before! After all being able to promote your business really well is always important, especially online! 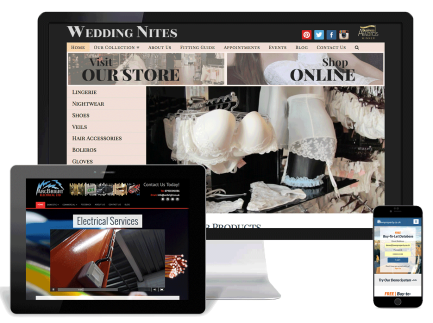 If you manage a business, keeping your website design up to date is essential, after all, perception is reality! Nothing says we are closed or worse still, going broke, better than a neglected website! New Targets created a corporate website and produced a number of videos for a client of mine in the property maintenance industry. They spent some time with the all the staff to find out the ethos and to analyse what the company did and had some excellent suggestions on how best to portray that to their clients in the form a website and a short video. They also produced a number training videos for future new staff starring the current staff. They were very professional, knowledgeable, great to work with and my client and I were very pleased with the results. Why us for Small Business Website Design? Small business website design packages to help you grow your online marketing presence. Working with video content for websites and being focused on increasing sales for our customers has helped us design new websites with visual impact, customer retention and sales effectiveness as key objectives. We have dealt with a range of customers over the years, and in very different markets. The challenge is mostly the same, they always have different personal tastes, specific goals, and clear visions for their sites and how it represents their business. The price of everything and the value of nothing! Poor website design is everywhere. Too often price dictates the web build and as a result the site suffer as a result. Poor websites actually work against the business they look to promote, they can be anti-sales, often confusing and hard to navigate. People make lightning fast decisions on what interests them. Your time is limited when potential customers are flicking from one page to the next. Budgets are important! We fully understand just how important a marketing budget is today. However, a really good sales centric website design should be at the very heart of all of your sales awareness and marketing strategies. We pride ourselves on understanding the sales process, helping the customer choose you, whilst being affordable. Book a FREE consultation for a website design review, Today! Small business website design packages to help you grow your online marketing presence. Our Databases work with iAuditor and Google Calendars. Store all sorts of files & information in folders that you create – direct from Dropbox or Google Drive.